2 Bedroom Flat For Sale in Guildford for Guide Price £395,000. Offered for sale with no onward chain. This is a well presented two bedroom ground floor apartment on one of Guildford's prime residential roads. The property is bright with well proportioned rooms, benefitting from direct access to the beautiful communal grounds. There is a well fitted kitchen with modern units, open sitting/ dining room with views over the garden, two bedrooms with built in wardrobes and an ensuite to the master bedroom. The family bathroom is accessed from the generous entrance hall with a useful coat cupboard and airing cupboard. The property benefits from a telephone entry system. The property is situated in a highly sought-after road on the edge of both Guildford town centre and the Downs. Within minutes of the Downs and around half a mile from Guildford's High Street and both mainline stations offering frequent services to London Waterloo in 30 to 40 minutes. The flat benefits from a predominantly south west orientation with views over the gardens and the best of the afternoon's sun. Guildford has a wide range of shopping, social and recreational amenities with excellent state and private schools within the area. The A3 provides access to the south coast and London and via the M25 to Heathrow and Gatwick Airports. 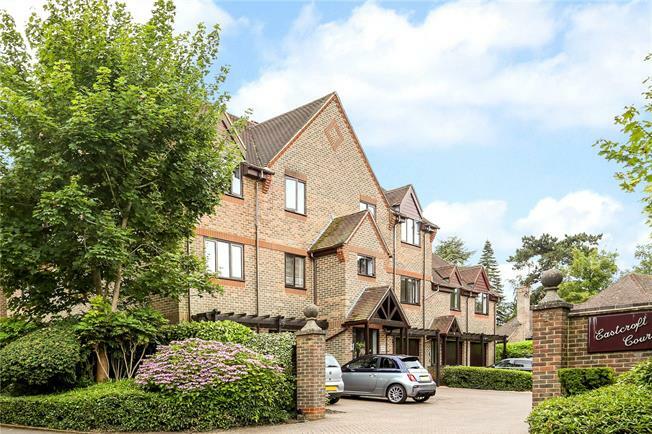 There are beautifully maintained mature communal gardens that are very private and laid to lawn with trees, hedging and flower borders adding detail to the space. The property benefits from a garage and additional parking. Guildford Borough Council Tel: 01483 505050. Tax band E.
Lease Length 125 years from 24/09/1988.